While reviewing a series of photographs, taken at the scene of a tragic crane accident, I was struck by the findings of the investigating officials; one of the primary causes of this event was the reliance of the crane operator on a single source of information about the current status of the crane. The operator relied on data being displayed on the LMI (load moment indicator) a little screen that showed the extension of the boom, the angle of the boom and the load on the crane. Sadly, the operator had not programmed the "computer" correctly, and the crane was being operated in a different configuration than the computer had been programmed to monitor. No lives were lost, but one worker sustained serious injuries that resulted in an amputation. This got me to thinking about our daily activities, and how often do we rely on only one source of information to make critical decisions, when sometimes two, three, or even more pieces of information are available for our use in that decision making process. When driving, for example, how often do we make a lane change, and only look in one of our rear-view mirrors? Modern cars come equipped with three. How often, when making that same lane change to we actually turn our heads to get a better view of what is in the next lane, or perhaps momentarily in our "blind spot"? Truly, what we don't see, can hurt us. When approaching an intersetion, where is our attention focused? Often, we only concentrate on the traffic light, maybe noting that it has been green for some time, and then wonder can we "make it" before it changes to amber and then red? But what about other sources of information available at that moment? Are we aware of our speed, or the road condition - rough, smooth, wet, dry? Do we get the big picture of other traffic - including others with which we share the road, such as pedestrians and those on bicycles? I would suggest you ask yourself these questions as assess your own driving behaviors, and make it a habit to not rely on a single source of information to make what can be a critical decision. The following article from the National Sleep Foundation is offered as many of us get ready to drive over the July 4th Holiday. Enjoy the holiday, including the travel and get back home safely. Less than half of Americans say they get a good night's sleep every night. Combine excessive sleepiness with an automobile, a long drive, and the one of the heaviest travel weekends of the year, and our risk for a fall-asleep crash increases significantly. In fact, 28% of American drivers have admitted to falling asleep at the wheel, according to a recent National Sleep Foundation poll, and more than half (54%) said they have driven while drowsy. "People think they can judge the precise time they are too tired and don’t realize that ‘drowsy driving’ is a serious danger," says David Cloud, CEO of the National Sleep Foundation. "They don’t know that it's possible to fall into a 3-4 second microsleep without realizing it. Traveling at 65 MPH, that's enough time to travel the length of a football field basically unconscious." Even if you manage to stay awake, sleepiness causes slower reaction times, vision impairment, lapses in judgment and delays in processing information, which are all critical elements for safe driving practices. "Getting enough sleep can literally save your life," adds Cloud. Prevent a fall-asleep crash by getting enough sleep the night before and by knowing the warning signs of sleepiness and using appropriate countermeasures. Warning Signs: Feeling Sleepy? Stop Driving! • Or finding yourself rolling down the windows or turning up the radio. • Get a good night's sleep before you hit the road. You'll want to be alert for the drive, so be sure to get adequate sleep (seven to nine hours) the night before you go. • Don't be too rushed to arrive at your destination. Many drivers try to maximize the holiday weekend by driving at night or without stopping for breaks. It's better to allow the time to drive alert and arrive alive. • Use the buddy system. Just as you should not swim alone, avoid driving alone for long distances. A buddy who remains awake for the journey can take a turn behind the wheel and help identify the warning signs of fatigue. • Take a break every 100 miles or 2 hours. Do something to refresh yourself like getting a snack, switching drivers, or going for a run. • Take a nap—find a safe place to take a 15 to 20-minute nap, if you think you might fall asleep. Be cautious about excessive drowsiness after waking up. For more information about drowsy driving prevention, visit the National Sleep Foundation’s Web site drowsydriving.org. a recent incident prompted this posting. In short, if you leave something that looks valuable, in plain sight, in your car - even if it's locked - you may find it gone, when you return to your car. We hear of this happening during the Christmas present shopping season, but it can and does happen during other times of the year. My son left a bag, that had the appearance of a camera bag, on the rear seat of his car, in the company parking lot. When returning to his car at the end of the day, the rear windo was broken out, and the bag was missing. It was NOT a camera bag, it only looked like one! It was his "lunch bag", so the thief got a plastic spoon, and an unwashed plastic food storage container, for taking the risk of being caught breaking into a car, and my son got a repair bill for replacing the broken window as well as the un-reimubursed cost of taking the time to search out the parts, and get it repaired. The lesson is - "out of sight out of mind". Don;t leave items of obvious (or apparent) value in plain sight. Also, if your car has a trunk release in the passengers' compartment, even if the trunk is locked, but one of the doors isn't, a prowler has a means to get in the trunk too. Please be safe out there, OK? What do you do to help new/young workers stay safe? Did you know that new, young and inexperienced workers are five times more likely to be injured at work in their first four weeks on the job? Often due to their inexperience, these workers are unable to perceive the hazards and risks associated with their new job; They may over-rate their own skills; Some young workers in particular may be adrenaline junkies and thrive on risky behavior (they are indestructible) both on and off the job; Others may have difficulty understanding and applying general orientation training; finally they may not understand their rights and therefore hesitate if asked to perform a task unsafely. Remember that this should not be a one-time orientation, but rather a continuing effort, not only for new employees, but for all employees. People learn in different ways and at different rates, making regular safety meetings a must. It also means that safety reminders should be part of every meeting with employees. This investment in an organization's most valuable asset - your employees will pay dividends for many years. The American Association of Safety Councils (AASC) has endorsed four root cause analysis (RCA) training programs offered by Apollo Associated Services. These programs utilize the structured Apollo RCA problem-solving methodology, which is widely used by corporations world-wide to eliminate and prevent problems that impact safety performance, revenues and achievement of business goals. These four, endorsed classes (covering RCA facilitation, leadership, participation and investigation) are already being offered by AASC members, including Evergreen Safety Council in Seattle, Washington; Great Lakes Safety Training Center in Midland, Michigan; Pacific Safety Council in San Diego; Safety Council of Louisiana Capital Area in Baton Rouge; and Suncoast Safety Council in Clearwater, Florida. • Avoid common problem-solving pitfalls and implement best practices. • Define any event-based problem, develop a causal understanding of events, and identify effective solutions. • Use RealityCharting software to build cause and effect charts, prepare RCA reports, and effectively communicate RCA findings. • Support causes with evidence, interview stakeholders, and facilitate RCAs. • Apply the method to real-world problems. • Align the objectives of the Apollo RCA program with the business goals. • Gain advanced RCA facilitation skills. • Effectively design, roll out, develop and manage RCA programs. • Assure program payback and develop measurable metrics. • Understand and more effectively manage complex issues like human error and behaviors. The one-day Participants course provides awareness-level training needed by those expected to participate in an incident investigation. Participants are often subject-matter experts who know the causes and may be expected to implement corrective actions. The 1.5-day Investigator Essentials course teaches the critical skills required to lead an effective investigation; produce credible results; and protect the credibility and integrity of the investigation team, problem owner and impacted parties/individuals. For more information about class offerings, visit Evergreen Safety Council. The American Association of Safety Councils is an international nonprofit association of safety council professionals whose mission is the enhancement of safety and health. With twenty-two member training centers in North America and Canada, AASC pools information and resources to better address the safety and health issues facing businesses, communities and individuals. For more than 20 years, Apollo Associated Services has led innovations in root cause analysis training, consulting, software and investigation solutions. Apollo helps organizations worldwide attain leading positions in a competitive global market by achieving measurable results, including: cost reduction, throughput gains, time savings, quality improvement, injury reduction, improved regulatory compliance and reduction/elimination of day-to-day problems. In recent weeks, we’ve had opportunity here at ESC to focus on the necessity to secure your load, regardless of the size of the vehicle. This means that there is a possibility for damage and injury from the loss of a load, not just for commercial vehicles, but for those of us who only make an occasional trip to the local transfer station. approximately 40% of the litter on our highways comes from unsecured loads. Debris on the roadways are accountable for 25,000 accidents in north America, annually – causing about a hundred fatalities. In Washington State, road debris contribute to 400 accidents, annually. $216 for transporting an unsecured load. $103 fine for losing a small thing like a piece of paper. Up to $5000 for the loss of a large item. Loss of a load that results in property damage or in an injury may result in a fine of up to $5000 and jail time. Don’t be like the person in the accompanying photo – secure any load you carry, to keep our roadways both safe and litter free. Thanks to the Washington State DOE for the above statistics and the Navy Safety Center for the photo. With summer time here, a lot of us like to travel to the Cascades and other outdoor areas to enjoy the wonders of the Pacific Northwest. Well, coming from the Chelan County area I know that come the middle to later part of July, thunder storms move in and lightning becomes a real issue for both fires and injuries to those caught out in the storm. Since June 20 – 26 is Lightning Safety Week we thought we would give some tips when you are outside during a lightning storm. According to the National Weather Service: The lightning safety community reminds you that there is little you can do to substantially reduce your risk if you are outside in a thunderstorm. The only completely safe action is to get inside a safe building or vehicle. So with that said, the weather service has a great website for lightning safety and if you want more information please check out their link. We must relate safety training to the bottom line. What will training of my employees do for our profits and ROI? The answer is “a lot”. We in the Northwest want to be on the forefront of global competitiveness. We are positioned very well in the scheme of things. We have great companies, small and large, who invest in their worker’s training. It is not a one time system, but a series of continually educating our workers. We all need to rethink our traditional workplace practices of on-the-job- training and provide each individual with the best training our budget will allow. As a result of forces such as new technology, globalization, the knowledge economy and changing demographics, our commitment to training and skills development is increasingly vital to success, even survival of our businesses. We need to upgrade the skills of adult workers. It will raise our productivity of all our businesses. We are the folks who can help you with your training needs with our Total Safety Compliance program. Contact our Executive Director Tom Odegaard or our Director of Training Eric Tofte today! Having recently returned from a trip to western New York State, I had opportunity to observe driving behavior in an area of our country, that I had not experienced before. This trip resulted in a major BFOO, for me. What’s a “BFOO”, you ask? A Blinding Flash Of the Obvious. People drive differently and driving laws vary in different states. The lesson for me was I still don’t know it all, even though I’ve driven for more than four decades. For example: RCW 46.61.440 establishes the speed limit in schools zones, here in Washington State to be a maximum of 20 mph in posted school zones. Most of us remember this, and abide by the law. Imagine my surprise when I discovered that the speed limit in school zones in NY is 15 mph. Another example of how different State’s laws may vary: Now that summer has arrived, the highway work season is fully underway. In my daily commute it seems that the “Road Construction” warning signs are everywhere. The State of Washington is very serious about protecting the workers on these road projects. Most of us have seen publicity exhorting drivers to “Give ‘em a brake” – give the workers in the construction zone extra attention and be ready to stop due to intrusions into your lane of travel by the equipment or workers. You probably have seen the signs informing drivers that “Traffic Fines are DOUBLE in work zones”. The State of NY takes safety in roadway work zones seriously, too. I was a bit surprised, and very pleased to see signs posted, reminding drivers in New York, that if they received two speeding infractions in work zones, their driver’s license will be suspended! If your or your company participates in roadway work, or work on the side of the road, you need to know and understand the laws regarding setting up roadway work zones and safely getting traffic through the work area. ESC offers the accredited Traffic Control Supervisor, as well as Traffic Control Flagger and Flagger Instructor classes to insure your workers are safe. Classes like these are essential in keeping your workers safe. I just read an interesting article about Twitter Haiku. Unfortunately, I am not a poet. Do any of you in Blogger land want to write about workplace safety & health in 5-7-5? Would you like to share? We would love to share your creativity with the world - Or at least here and on our Facebook and Twitter accounts. The WA Fatality Assessment and Control Evaluation (FACE) Program publishes Fatality Narratives. These narratives are one-page reports that summarize work-related fatal incidents, list some requirements and recommendations that may have prevented the incident from occurring, and give a brief statistical summary. They are currently focusing on construction industry fatalities. These Narratives provide preliminary information about the incident to the interested community, similar to OSHA's Fatal Facts and MSHA's Fatalgrams. To sign up for FACE construction narratives, NEW FACE agriculture narratives, and investigation reports for this link. We encourage you to explore other material on their website. The FACE Program is partially funded by the National Institute for Occupational Safety and Health (NIOSH) (Cooperative Agreement No. : 3 U60 OH008487-02S1) and the Safety and Health Assessment and Research for Prevention (SHARP) Program at the Washington State Department of Labor and Industries. The contents of the Fatality Narratives are solely the responsibility of the authors and do not necessarily represent the official views NIOSH. We encourage you to use these narratives for formal or informal educational opportunities to help prevent similar incidents. On May 18 the Department of Labor and Industries adopted changes that will clarify the definition of the term “hospitalization” to reduce confusion and bring the department's rules into line with the Occupational Safety and Health Administration's interpretation of the word. According to L&I there was some confusion about the requirement to report a hospitalization within eight hours in Chapter 296-800 WAC, Safety and Health Core Rules. To take a look at the rule language, follow this link. Why make a business case for training investments? What will it mean to the bottom line? Which elements of your business can benefit most from safety training? What will be the results? Why should you spend money on training? How will training help in the success of your business? This requires you to identify and then quantify the impact your training will have on the bottom line of the business! 1. Are learners showing up for classes? 2. Are people moving trough the course? 4. How well did learners score? 5. How was the program received? What do you think the cost of not training is? You need to focus not on the training, but on the training’s results. Is your management seeing a link between training and business performance? How do you justify the training expenses, well look at your profit at the end of the project or measurable time period? Remember “cost savings is a reduction in expenses” and that is what we can help you with here at Evergreen Safety with our Total Safety Compliance program. Give Tina, our customer service representative a call today, 206-382-4090. She will be able to answer any questions you might have. How is your fall protection program? With summer here, outside projects become more prevelant once again and working at heights is sometimes part of the job. Working at heights is dangerous, but with the right training and equipment you can work safely from heights. Remember, here in the state of Washington you have to protect employees from falling if they are on a walking/working surface 4 feet or more above the adjacent level. So pay attention and don’t short-cut safety when working at heights. If you want more information or training, give Evergreen a call. You can also check the NIOSH site on falls. The Department of Labor & Industries has launched a blog highlighting the agency's work combating workers' comp and contractor fraud. The blog, called Nailed, contains information about major fraud convictions, surveillance video from investigations and links to fraud-related news coverage. "People tend to think fraud only involves workers cheating the workers' comp system, but it's much more than that," said Carl Hammersburg, fraud prevention and compliance program manager and author of Nailed. "Millions of dollars are lost when employers, medical providers and contractors commit fraud. I also hope Nailed will attract attention to workers' comp fraud and encourage more people to tip us off to fraudulent activities." "Contractor Gets Nailed" features a bad contractor leaving court in handcuffs. "Tip of an iceberg leads to a Titanic assessment" tells how a tip lead investigators to $672,326. "L&I investigation helps to convict child killer" describes an L&I investigation that helped in the murder case of Joel Zellmer. Is Your Company an Innovator? We have been talking about Return On Investment (ROI) for safety training of your employees. Is your company an Innovator when it comes to addressing your Human Capital? When it comes to safety training you need to focus on the organization’s goals. You need to have a proper needs analysis up front and then evaluate your results on an on-going basis. Do you know that most companies spend less than 1% on their training budgets to measure and evaluate their training results? We need to measure worthy performance not just the cost of the training. Let us know if we may help you with your safety training requirements. We are the folks who bring you Total Safety Compliance, the complete program to save you time and costs. There is a new web page on why you should Hang Up & Drive, which explains the new cell phone law. We are referring to it as the "new" law just to avoid confusion. We all know it's been around for a few years, and is just now becoming truly enforceable, although there are new elements with the teen restrictions. RCW 46.61.667 is the law concerning talking on a cell phone and driving which is $124 fine. 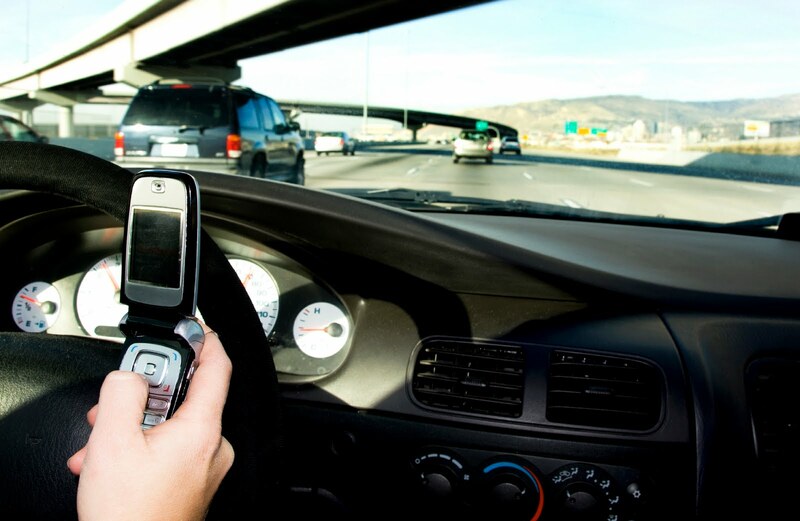 RCW 46.61.668 is the law concerning texting while driving which is $124 fine. RCW 46.20.055 is the law concerning violations of an instruction permit which is a $124 fine. RCW 46.20.075 is the law concerning violations of an IDL which is a $124 fine. The HB6345 makes it a primary offense for a person with an instruction permit or Intermediate Drivers License to be talking on a cell phone. The rest of the statutes remain the same, which are secondary violations. Officers will be stopping drivers for talking or texting under those laws no matter what their ages are. Then once stopped and they hand over an instruction permit or IDL, they could be cited in addition to the cell/text law for violating their instruction permit or IDL. For more information contact the Washington Traffic Safety Commission or the Washington State Patrol. One benefit of living in Northwest is that one doesn’t need to travel far from the city to be in relatively “wild” country. However, as the population density increases, cities grow and housing developments continue to move out into the country, the chances of human / wildlife encounters increases proportionately. We live in the country, in a heavily wooded area, where the typical property ranges anywhere from two to ten or more acres. As such, encounters with wild life are relatively frequent. Rabbits, ‘possum, coyotes, raccoons and deer all seem to think my vegetable garden and fruit trees – not to mention my tulips and daffodils – were planted solely for their benefit. A recent event caused me to do some research and through this newsletter, share the information with you, our readers. At last count, we have a dozen or more species of birds that frequent our feeders, and yes we do enjoy watching them as they feed. Mother’s Day morning we opened the curtains to find that our main feeder was missing! Closer inspection disclosed that the feeder which is supported on a pipe system from our deck was lying on the ground, empty! More surprising, the supporting steel pipe was broken in half. An afternoon walk on our trail through our woods, gave us a clue as to the damaged feeder; in a muddy area we found tracks, black bear tracks, and FRESH black bear tracks. While not all of us live in the woods, most of us have opportunity to either go camping or at least make a day trip for a picnic, into wooded areas. 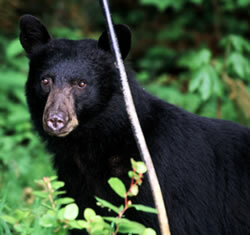 Encountering a black bear is not all that uncommon; knowing a few facts can keep that encounter from turning “bad”. According to the Washington State Department of Fish and Wildlife, the statewide black bear population in Washington likely ranges between 25,000 and 30,000 animals. Bears usually avoid people, but when they do come into close proximity of each other, the bear’s strength and surprising speed make it potentially dangerous. Most confrontations with bears are the result of a surprise encounter at close range. All bears should be given plenty of respect and room to retreat without feeling threatened. In the spring, black bear diets consist mostly of herbaceous plants, from emerging grasses and sedges to horsetail and various flowering plants. In summer, bears typically add ants, bees, grubs, and a host of later emerging plants to their diets. During late summer and fall, bears typically shift their diets toward tree fruits, berries, and nuts, but they still may consume a variety of plants. Fall is a critical season for black bears and they commonly acquire most of their annual fat accumulation at this time. Bears may forage up to 20 hours a day during fall, increasing their body weight by 35 percent in preparation for winter. Bears tend to avoid humans. However, human-habituated bears are bears that, because of prolonged exposure to people, have lost their natural fear or wariness around people. Human-food-conditioned bears are those that associate people with food. Such bears can become aggressive in their pursuit of a meal. State wildlife offices receive hundreds of black bear complaints each year regarding urban sightings, property damage, attacks on livestock, and bear/human confrontations. The number one reason for conflict is the result of irresponsibility on the part of people: Access to trash, pet food, bird feeders, and improper storage of food while camping, make up the majority of the calls. Don’t feed bears. Often people leave food out for bears so they can take pictures of them or show them to visiting friends. Over 90 percent of bear/human conflicts result from bears being conditioned to associate food with humans. A wild bear can become permanently food-conditioned after only one handout experience. The sad reality is that these bears will likely die, being killed by someone protecting their property, or by a wildlife manager having to remove a potentially dangerous bear. Manage your garbage. Bears will expend a great amount of time and energy digging under, breaking down, or crawling over barriers to get food, including garbage. If you have a pickup service, put garbage out shortly before the truck arrives—not the night before. If you’re leaving several days before pickup, haul your garbage to a dump. If necessary, frequently haul your garbage to a dumpsite to avoid odors. Remove other attractants. Remove bird feeders (suet and seed feeders), which allow residue to build up on the ground below them, from early March through November. Bring in hummingbird feeders at night. (Better yet: plant bird-friendly landscapes and don’t use feeders.) Harvest orchard fruit from trees regularly (rotting fruit left on the ground is a powerful bear attractant). If you have bear problems and do not use your fruit trees, consider removing them. Do not feed pets outside. Clean barbecue grills after each use. Wash the grill or burn off smells, food residue, and grease; store the equipment in a shed or garage and keep the door closed. If you can smell your barbecue then it is not clean enough. Avoid the use of outdoor refrigerators—they will attract bears. Keep a clean camp. Put garbage in wildlife-resistant trash containers. Store food in double plastic bags and, when possible, place the bags in your vehicle's trunk or in wildlife-resistant food lockers. Double-wrapped food may also be placed in a backpack or other container and hang it from a tree branch at least 10 feet above the ground and 4 feet out from the tree trunk. Never store food in your tent. When camping, sleep at least 100 yards from your cooking area and food storage site. Hike in small groups and make your presence known by singing or talking. Keep small children close and on trails. Stay calm and avoid direct eye contact, which could elicit a charge. Try to stay upwind and identify yourself as a human by standing up, talking and waving your hands above your head. Do not approach the bear, particularly if cubs are present. Give the bear plenty of room. If the bear attacks, fight back aggressively. As a last resort, should the attack continue, protect yourself by curling into a ball or lying on the ground on your stomach and playing dead. I commute a relatively long distance from my home to my office. While our modern highway system does a pretty good job of moving traffic, there is not a week that goes by when I don’t see at least one “situation” caused by the loss of part of the load from a vehicle. Even this morning I saw a car suddenly swerve into and back out of the next lane as they attempted to dodge heavy chunks of tree bark that was falling off of a load of logs, on a truck in the adjacent lane. If your business operates trucks, and those trucks carry a load of some kind, you must insure that the load is secured. Sounds easy enough, but apparently this is not always the case. The photo shows a piece of debris removed from the north bound lanes of Interstate 5, in the early part of the morning commute, a few weeks ago, at the Ship Canal Bridge. Lanes on the bridge were temporarily blocked as Troopers quickly removed the over 200 pound steel ramp from the left 2 lanes, but not before nearly a dozen motorists ran over it. Thankfully, there were no injuries as a result of the lost debris and most of the damage consisted of flat tires and bent wheels. However; the steel ramp did puncture the fuel tank of one pickup truck causing a small gas leak and fire, which was quickly contained. The stories like this one never seem to end. Most of us “regular drivers” have our own stories of dodging debris either already on the road, or unexpectedly falling from a truck rolling along beside us. Even those weekend trips to the transfer station require that we secure our load properly so nothing escapes in route. Take a few extra moments if you are carrying a load on your vehicle to insure it is proper secured. Always keep a safe following distance (4 seconds or more behind the vehicle ahead) to insure you have adequate space and time to react in case part of their load should drop off. If you have questions regarding how best to secure your load, ESC offers a free online training. If you have drivers working for you, or simply want to refresh your driving skills, contact ESC about our Eversafe Driving Course; do all you can to NOT become another roadway statistic. A large “Thank You” to the Washington State Patrol for the information in this posting. KING COUNTY, WA – Local law enforcement and community partners in traffic safety were honored Tuesday for their contributions to making King County residents safer today on the roads than ever, and their commitment in working to reduce traffic fatalities even further. On average, 24 fewer people died annually on average in 2007 and 2008, compared with the 2002-2006 period, a drop from an annual average of 118 deaths annually to 94. This downward trend appears to continue in 2009, with preliminary data showing a further drop to 76 deaths from crashes. Several factors may be contributing to the drop in fatalities, including strong enforcement of driving under the influence (DUI) laws, better automotive safety equipment, seat belt usage, changes in driving habits, and traffic engineering improvements. While traffic fatalities are dropping nationally and statewide, King County’s traffic fatality rate is the lowest in the state. As key partners in traffic safety, DUI patrol officers from 28 local law enforcement agencies were recognized for their work in contributing to safe roads by arresting drivers under the influence of alcohol or drugs. Impaired driving is the leading cause of traffic fatalities in King County. Since 1999, officers working X-52 DUI and other impaired driving emphasis patrols have made 22,575 driver contacts and arrested 6,123 impaired drivers. Even with recent successes, traffic safety remains a serious concern. From 2004 to 2008, 568 people died in traffic crashes in King County, and another 98,000 were injured. Crashes kill and injure all road users: drivers and passengers as well as motorcyclists, bicyclists, and pedestrians. As a next step toward the statewide Target Zero goal of no traffic fatalities by 2030, a new cell phone law will go into effect on June 10. Under the new state law, holding a cell phone or texting when driving becomes a primary offense and teen drivers with an intermediate driver license are not allowed to use any electronic device while driving. State Senator Tracey Eide and State Representative Reuven Carlyle, sponsors of the legislation in the Senate and the House, were recognized for their leadership, as was the community-led Driven to Distraction taskforce that advocated effectively for the law. For over a decade, the King County Traffic Safety Coalition (now known as the King County Target Zero Task Force) has brought together law enforcement, public health and community partners to reduce traffic deaths and injuries. In partnership with the Washington Traffic Safety Commission, they are working towards the Target Zero goal of zero traffic fatalities by the year 2030. Facets of these topics were presented at the 2010 Washington Traffic Safety Conference last month. For highlights of the presentations, visit the ESC website, or for the photo album visit ESC's facebook page. If you or your employees drive in Oregon, mark your calendars for Tuesday, September 21st for the Oregon Employers for Traffic Safety Conference. You need to see results on your dollars spent on safety training. You need proof that safety training is actually helping people learn. You need to see bottom-line results. The most successful companies who want to remain competitive must continually look for ways to better train their employees. You need to manage Human Capital. You need to invest in workers, encouraging workers to invest in themselves and provide a good learning environment. Training expenditures are a unique form of business expense. Unlike other expenses, training costs represent an investment by the firm to the employees. You must focus not only on the training but on the training’s results. Give Roger a call today, 206-382-4090. He will be able to answer any questions you might have.